Dimensions : H 99 x W 45 x D 61.5 cm. Upholstered in beautiful silver grey crushed velvet. Glamorous diamante detailed back rest. Works well as a dining chair or occassional chair. Modern Styling for Contemporary Dining. All deliveries are one man deliveries and the driver may need assistance to unload the item. 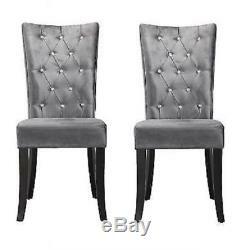 The item "4 x Chairs Silver Grey Crushed Velvet Fabric Stunning Dining Chairs Dining Chair" is in sale since Sunday, December 24, 2017.